I honestly believed writing an Amigos review would mean I would just regurgitate the other dating sites in the same networks’ reviews (like Adult Friend Finder). Luckily, thankfully, they’re different. Here are all the lovely details to help you decide if you want to sign up or not. I thought I was signing up for the service to write this Amigos review, but really, I was just getting a list of users near me that fit my age criteria. Of the results, most were 3 or over 2,000 kilometers away, and many of the profiles were in Spanish only. If you click on an users picture or details, you’re prompted to sign up. Five steps of basic information (along with a reminder that there are 10,816 singles “near me” – on a different continent) and you’re done signing up. I took about three minutes (with a copy/paste for a profile) to fill everything out, and a few seconds to go confirm my email address. The messaging center resembles an old school email program, and the rest of the site is about the same. There’s an older, yet solid feel to the site, with lots of smiling faces from different profile photos. Sadly/perhaps just honestly, most of the smiling profile pictures are very much real. No fake photos here. The search (for women, anyway) defaults to 800km away (? ), 5 years younger and 10 years older, so I changed everything. +/- 5 years, 20km, online within the last month, and with a photo. One result. Just one. He definitely was not Hispanic. If I expanded my age range (to much older) there were significantly more members. Still, none were Hispanic – although that could just be the demographics of the area I searched from. Note: being able to see how recently members have visited the website is an amazing free feature. I highly recommend using it to determine if you want to pay or not when available. It’s rare that it is, and it thrilled me to see this when writing this Amigos review. Awesome! You read the fine print for every single dating site you’ve ever signed up for… but just in case… here’s what you need to know. Your subscription, should you pay for one, will be automatically renewed at the end of the term for the same term unless you specifically cancel (set an alarm a week prior to cancel, my suggestion). All standard fare for most online dating sites, and specifically for the Friend Finder Network (of which Amigos belongs to, along with Adult Friend Finder and BigChurch). Oh, also? “Persons appearing in photographs may not be actual members.” Not sure what to do with that one, other than just to leave it here. According to FindTheData in late 2016, Amigos gets 340,000 page views a month which puts it at 60th on the top dating sites for traffic in the world. 68% of its members are male, 88% are under 44, 54% are Hispanic, and 84% earn less than $49,999 a year. You can choose Silver or Gold membership levels if you sign up with Amigos. Silver: One month costs $13.95, three months costs $11.99 each (billed in three-month installments). You get put in search between free and Gold members, partial access to blogs and groups, and can contact new members. Gold: One month costs $27.95, or $11.95 each for three months (billed in three-month installments). When I signed up, they offered me another free month for 3-months of Gold service. You’ll get first access to new members, full access to all features (including full member video intros), and access to members in your network’s social chat profiles (such as Yahoo! Chat, ICQ, and others). You can remain a free member without paying, however, you won’t be able to contact other members. Paying members will have to contact you. 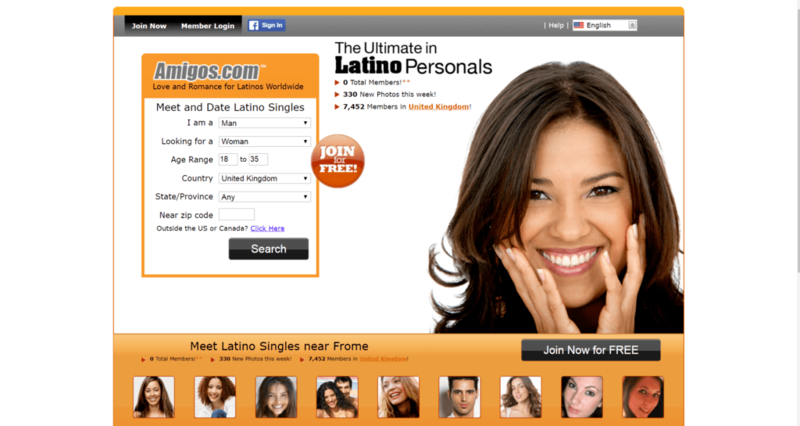 If you’re Hispanic, Latin, or want to meet someone that is, I highly recommend signing up with Amigos. Sign-up and use their great search features to see if there’s anyone near you that interests you. Yes? Then, definitely sign up – it’s one of the cheaper, major dating sites out there. Have you used the site? Good? Bad? Indifferent? I’d love to hear about your experiences, just scroll down to add your own Amigos review in the comments. Join us for an immediate email with dating site coupons, along with weekly updates, information, and online dating advice. Get Access To Secret Dating Site Discounts! Join us to get an immediate email with dating site coupons, as well as a weekly online dating advice, updates and information.